Hey look, it’s Pierre Blanchar! For realz. 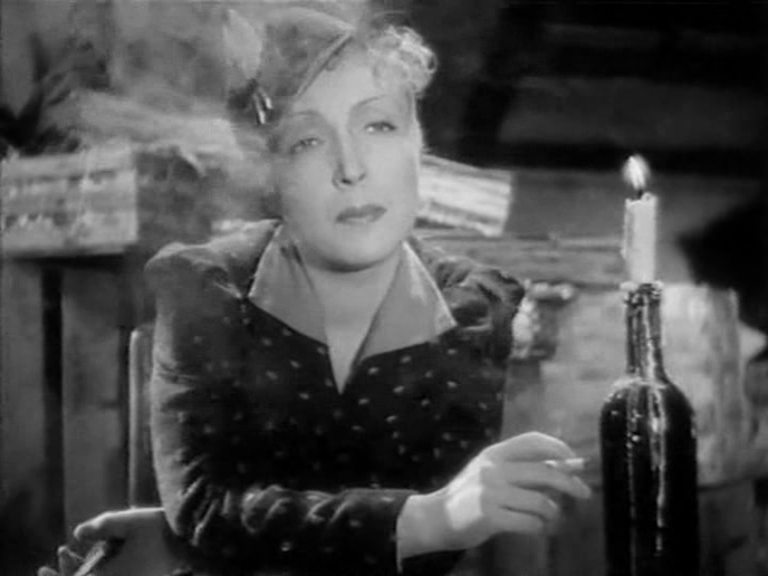 Despite being directed by a German, Pabst’s MADEMOISELLE DOCTEUR is extremely French — for much of its running time it’s essentially a romance in which a variety of secret agents and double agents fail to do their patriotic duty because they’re all in love with members of the enemy sides. When I started watching, I was quickly confused, owing to the less-is-more approach to subtitling. The fan who subbed it seems to have left out bits he found boring, and other bits he found too difficult, and with my concussed-schoolboy French I had no way of knowing which was which. And the plot seemed to be leaping arpund all over the place. Pierre Blanchar is introduced in prison, being recruited to betray his own side (the Germans, I think — it seems to be WWI) but then disappears for so long that when Jean-Louis Barrault turned up, with his similarly razorsharp cheekbones but looking otherwise not much like Blanchar, I thought it was him. Barrault buys a slice of melon from Louis Jouvet in an unusually intense manner and then disappears from the story completely. Everybody is in love with the wrong person — as in The Sea Gull or LES ENFANTS DU PARADIS. Viviane Romance loves Pierre Blanchar and betrays fellow agent Dita Parlo (the masterspy of the title) because she suspects he’s smitten with her. 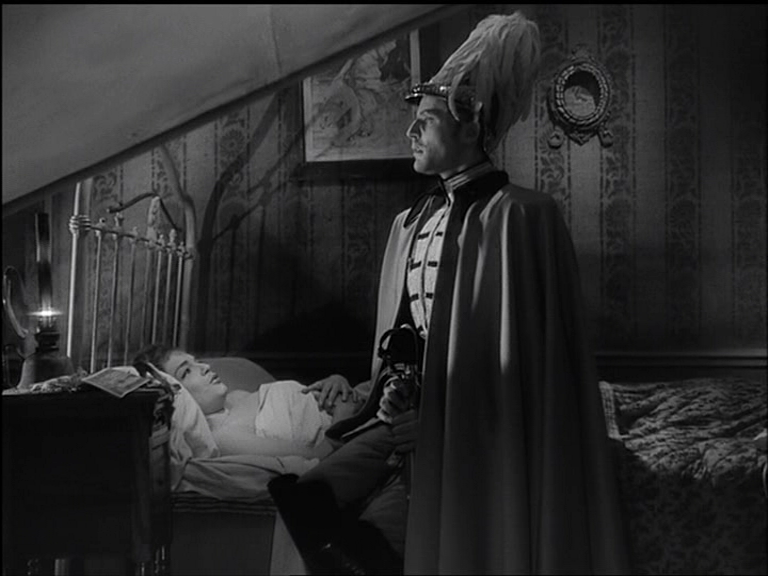 Blanchar is supposed to betray Parlo to the French but doesn’t because he IS smitten with her. 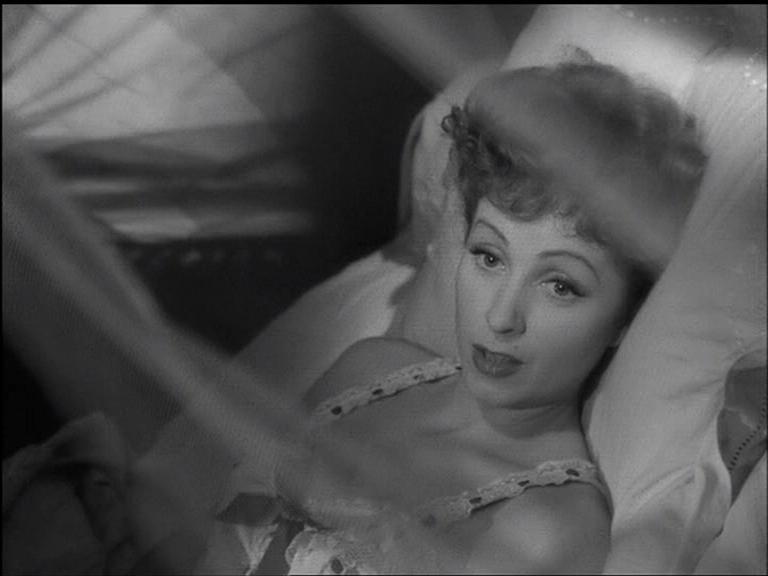 Parlo is supposed to steal the secret plans from Pierre Fresnay but doesn’t because she’s smitten with him. 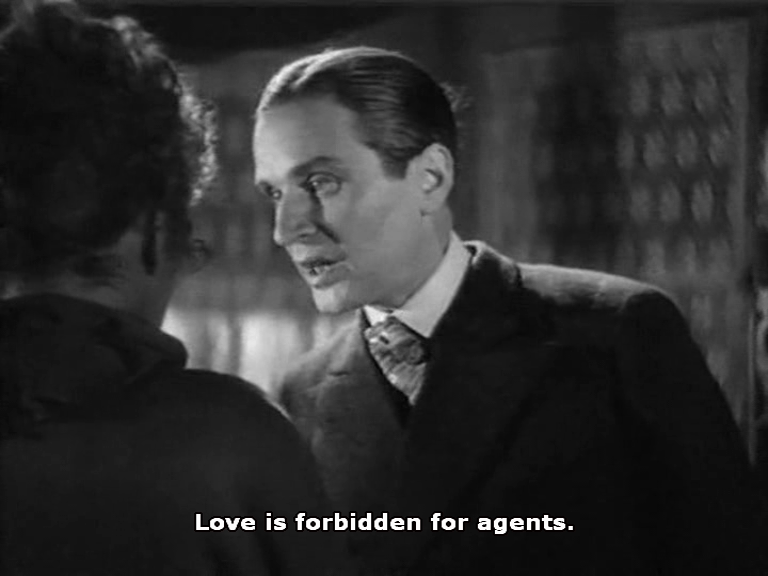 Fresnay is completely in the dark about Parlo being an enemy agent so at least his being smitten with her isn’t treason, but it is undeniably a security risk. Jouvet alone remains uncompromised. So with Topic A on everybody’s minds, I could relax about whether the Bulgarians were negotiating a separate peace — an impossible thing for anyone to get worked-up about, I’d have thought — and just enjoy the romantic angst amid seamy and exotic settings, as each of the cast attempts to out-louche the rest. Blanchar, sporting a fez, has an unfair advantage. The rules of poetic realism demand that love end in tragedy, and by making everyone political enemies, most of them on the losing side in a global apocalypse, Pabst and his army of writers have stacked the deck admirably. We can’t predict just how it’ll turn out, but it is utterly impossible for it to end well for anyone. 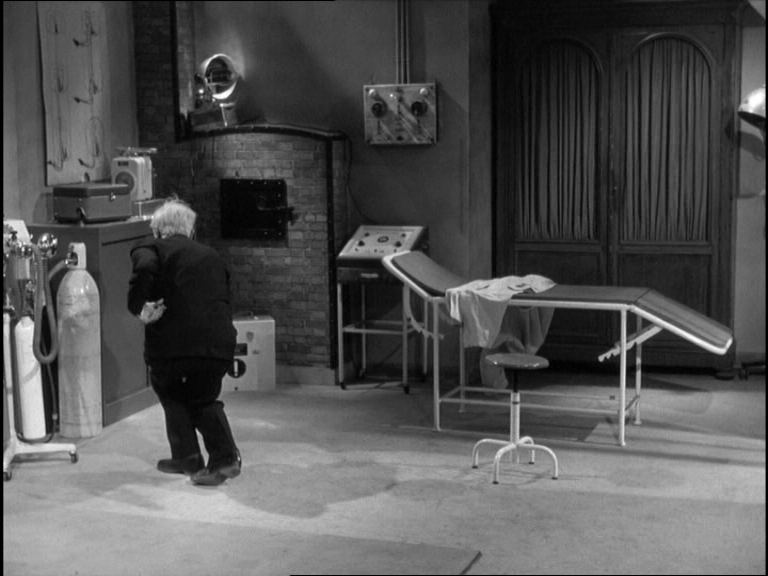 Still, the last scene’s entirely unromantic bleakness took me by surprise. You can either end up shot by firing squad, insane and mumbling, or lying dead in a heap of melons. C’est l’amour. *Unsuccessful? A MODERN HERO features Marjorie Rambeau as an alcoholic one-armed ex-leopard trainer**. That one fact puts it ahead of Lewis Gilbert’s entire filmography. **An ex-trainer of leopards. Not a trainer of ex-leopards. Because that would be stupid. Remarkable how many filmmakers of world class have been attracted to Robert Louis Stevenson’s The Strange Case of Dr. Jekyll and Mr. Hyde. And of course, how many dodgy ones too. 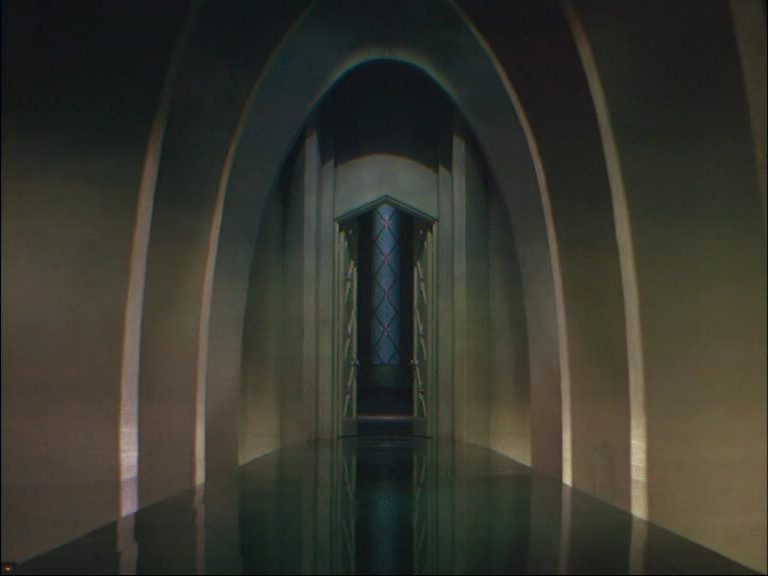 Among the cinematic Jekylls we can count Rouben Mamoulian, Jerry Lewis and Jean Renoir, while Hydes might include Jesus Franco, Walerian Borowczyk and Terence Fisher. 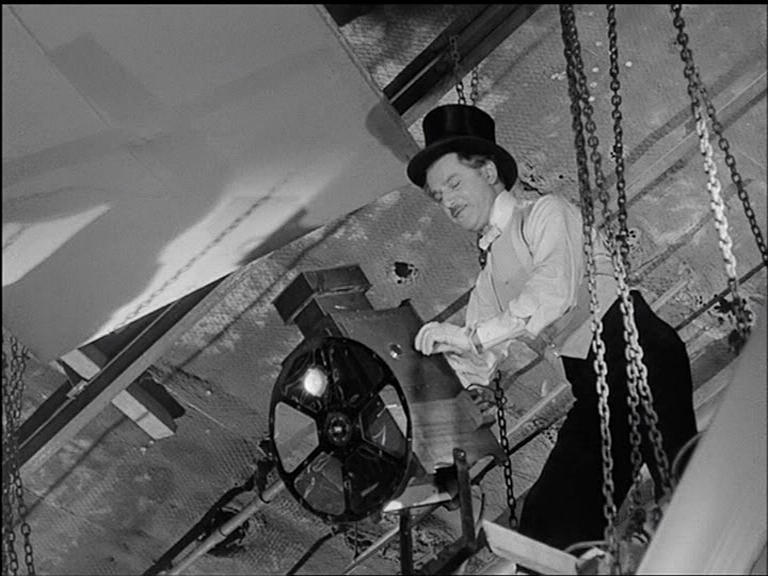 And then some solid middlebrows like Stephen Frears and Victor Fleming, equivalent to Stevenson’s sedate protagonist, Mr. Utterson, have had a bash too. 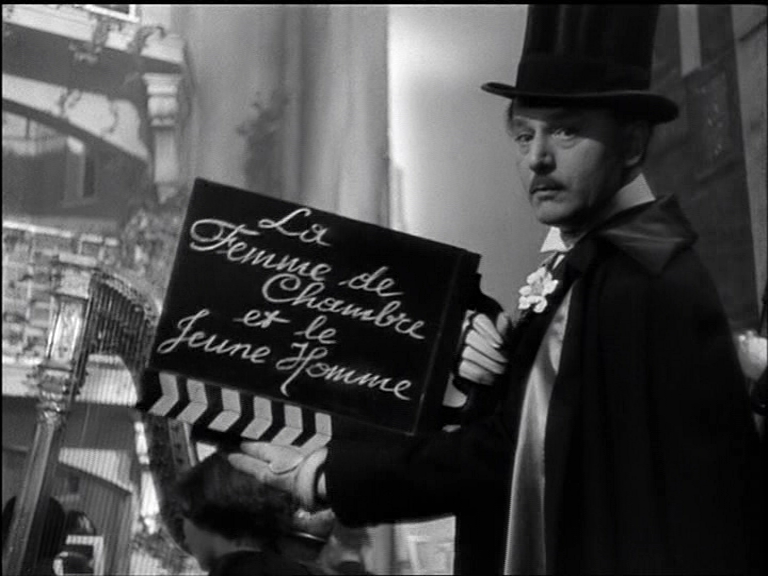 By a peculiar quirk of fate, the most respected filmmaker to have come near the book is Renoir, yet the film he made for French TV, THE TESTAMENT OF DR. CORDELIER, has traditionally been one of the most neglected and/or despised in his entire egg (or oeuvre, to give it its French name). 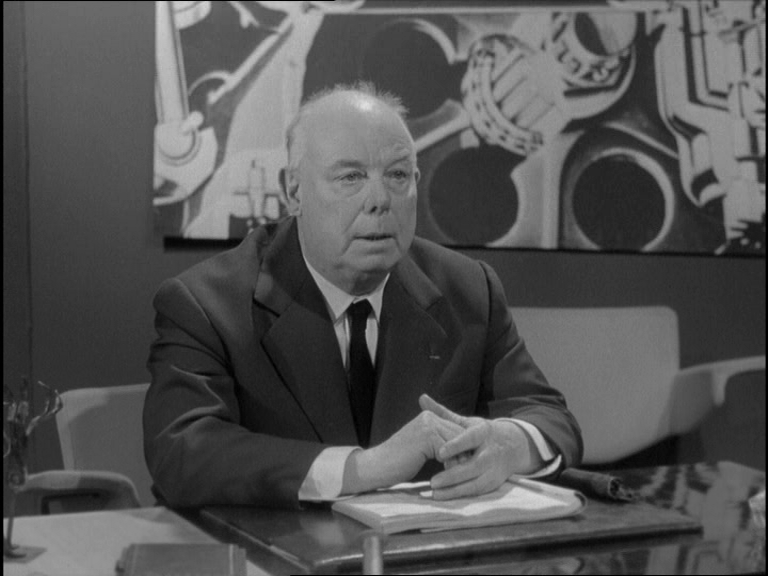 Also ironically, Renoir’s film updates and translocates the story to its own bizarre version of 1959 France, changing all the character names in doing so (but with more justification than I, MONSTER, where Jekyll becomes Charles Marlow and Hyde becomes Blake Edwards, sorry, Edward Blake, FOR NO REASON), and yet it’s by far the most faithful adaptation to Stevenson’s original narrative structure. This is kind of a perversity, since Stevenson’s story is in essence a mystery with a novel solution, which procedes on the understanding that the reader doesn’t know the central plot gimmick (that split-personality thing). 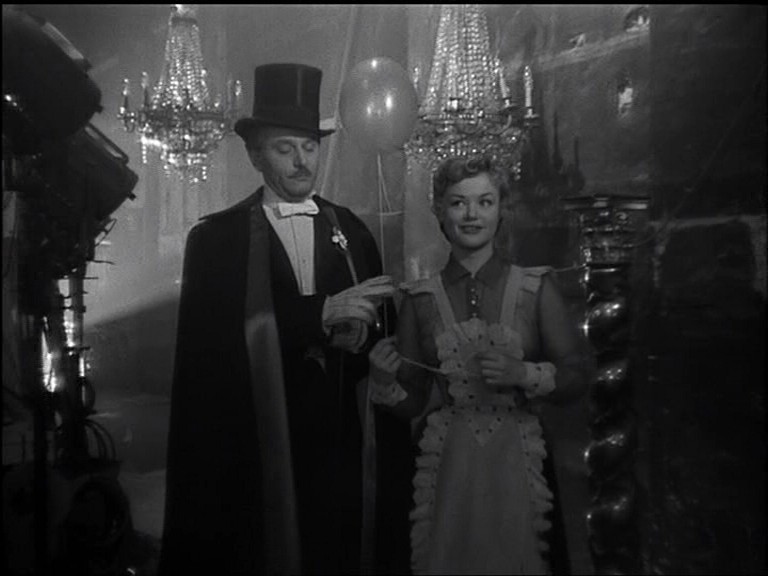 By the time of Renoir’s version, of course audiences are going to be well ahead of the story, yet Uncle Jean procedes as if we were all complerely innocent. 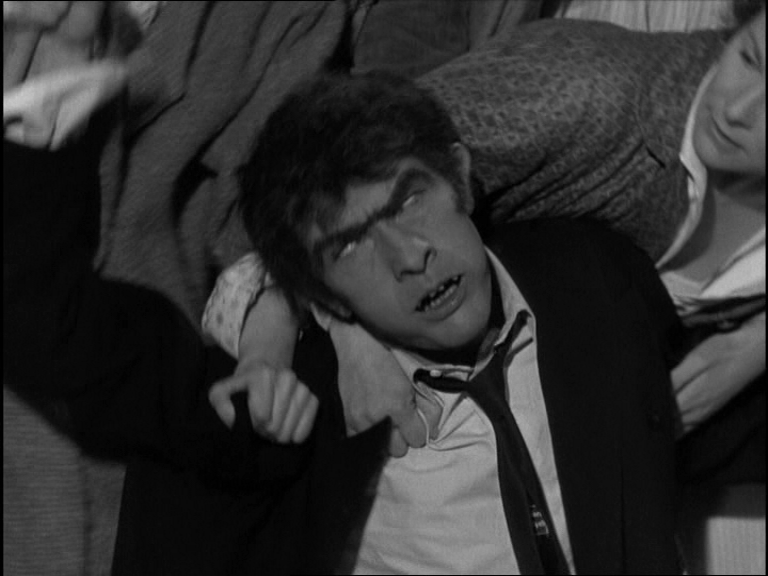 This sets the tone for the film’s overall peculiarity. The film begins at the very apex of oddness with Renoir arriving at a TV studio to make some kind of broadcast to the nation. This he does, and we dissolve to the story he’s telling, which he seems to imply has been PLUCKED FROM THE HEADLINES, though this is not entirely clear. A prepared film begins to play, with Renoir’s V.O. running over it, and then we are into the story, with Dr. Cordelier’s unusual testament being presented to his lawyer Mr. Joly. As played by Teddy Bilis, he’s as staunch and dull as Stevenson’s Utterson, yet also brave, loyal and rather admirable — mostly. 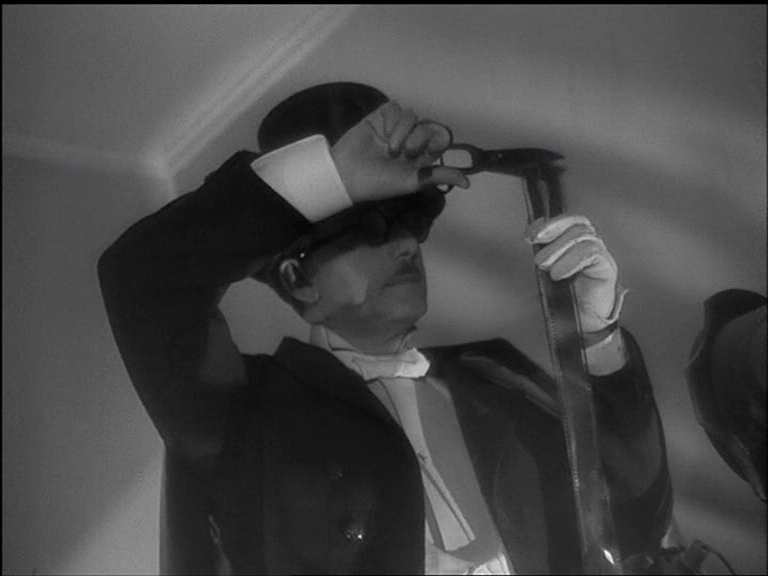 Cordelier/Jekyll is Jean-Louis Barrault, the mime from LES ENFANTS DU PARADIS, a brilliant casting coup. 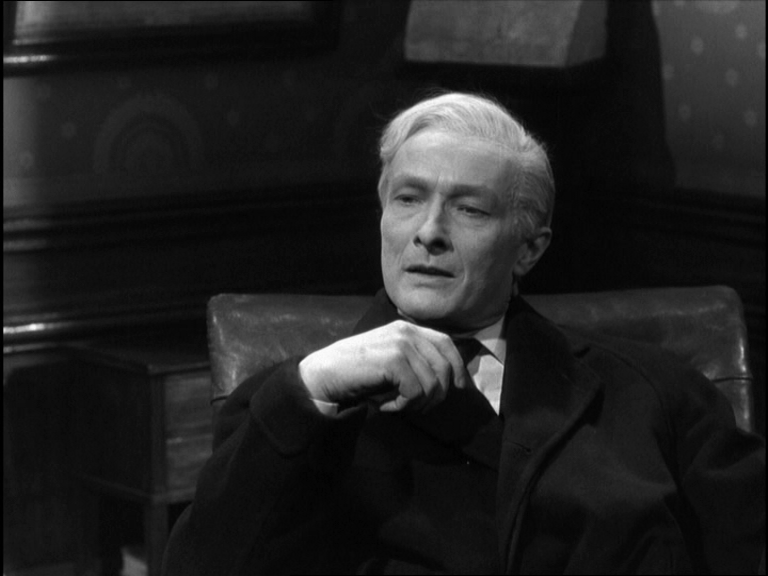 As Cordelier he’s as erect and crisp as Peter Cushing, with the severity and intensity of Georges Franju. Joly is baffled that Cordelier, formerly a successful psychiatrist, is leaving his entire fortune to somebody named M. Opale, a stranger to Joly. This altered will is the first titular testament, but not the last. Faithfulness and tampering are kept in a constant dynamic by Renoir’s treatment of the story: when we first meet Hyde in the book, he’s carelessly trampling a little girl. But to show that onscreen, from the point of view of a distant onlooker, would be impossible without risking injury to a child: if you cut into close shots of feet and stuff in order to make it merely SEEM violent, you break the P.O.V. Today we could trample a C.G.I. child with abandon, but Renoir resorts to a different solution: Hyde wantonly attacks the little girl, swinging her around like a rag doll and attempting to choke her with his cane. This necessary change somewhat alters Hyde’s character, and Renoir runs with this idea, showing the villain as impulsively driven to wanton acts of cruelty throughout the story. Barrault’s performance is remarkable: for some reason, Renoir apparently claimed that the actor worked without makeup, a blatant lie. What I expect he meant is that Barrault worked with a MASSIVE amount of makeup, all over his face and body. His nose and cheeks appear to be stuffed with cotton wool a la Brando’s Don Corleone, he has a dark wig and bushy eyebrows, ludicrously hairy hands, false teeth, and what are either weird sideburns curling under his eyes, or just very dark shading. To be honest, it’s not the subtlest makeup. 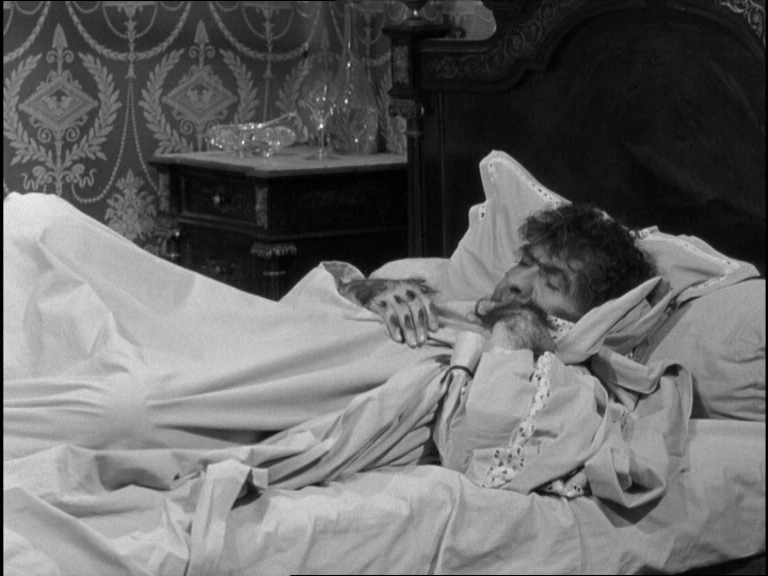 Stevenson says that Hyde has an air of deformity about him, without you being able to quite put your finger on it. Various attempts have been made at capturing this elusive idea, none entirely successful. Supposedly Lon Chaney Sr. used to remove the odd scar of deformity from each makeup, before he considered it complete (as a woman perparing for a night out should consider losing one element of her look — a necklace, a belt, or perhaps those underpants? — before leaving the house). Barrault might have benefitted from this advice. The hairy hands definitely seem like a mistake: pure sketch show comedy. 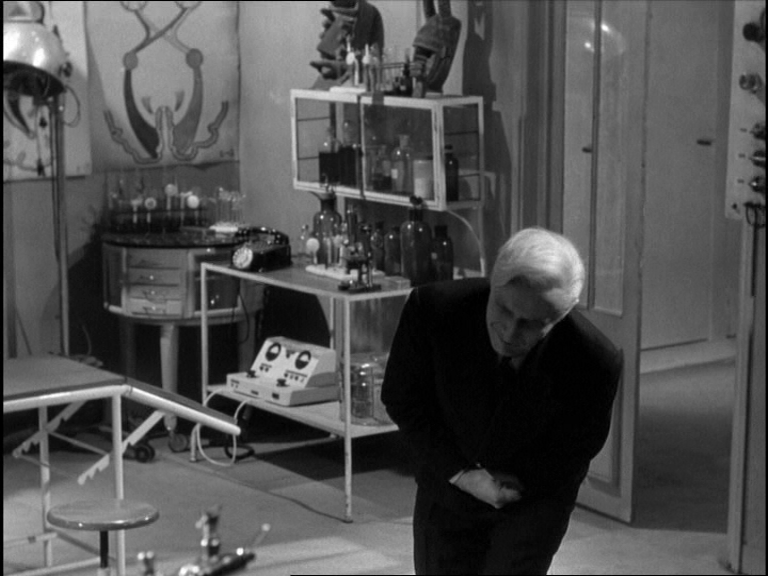 Of course, filmmakers who go for minimalism are usually screwed too: you get Clark Kent Syndrome, as in, “How come nobody notices it’s the same guy?” This is somewhat true with Spencer Tracy (but his film’s too boring to even talk about) and massively so with John Malkovich in MARY REILLY. But Barrault has his physical skills, and here he excels as the best Hyde since Fredric March (who also had a slightly O.T.T. neanderthal/Fred West makeup). Dressed in a David Byrne type oversized suit, he’s the only Hyde to really work with the idea of a Hyde who’s smaller than his Jekyll. He’s also slouchy, loose-limbed yet somehow alive with nervous tension, his slender frame tortured by tics, some of which he disguises as jaunty little movements. When he first appears, swinging his cane, he seems like a circus clown. Joly calms the angry mob by handing money to the careless mother of the trampled child, a slightly cynical gesture motivated by his desire to protect Cordelier from scandal caused by Opale’s actions. 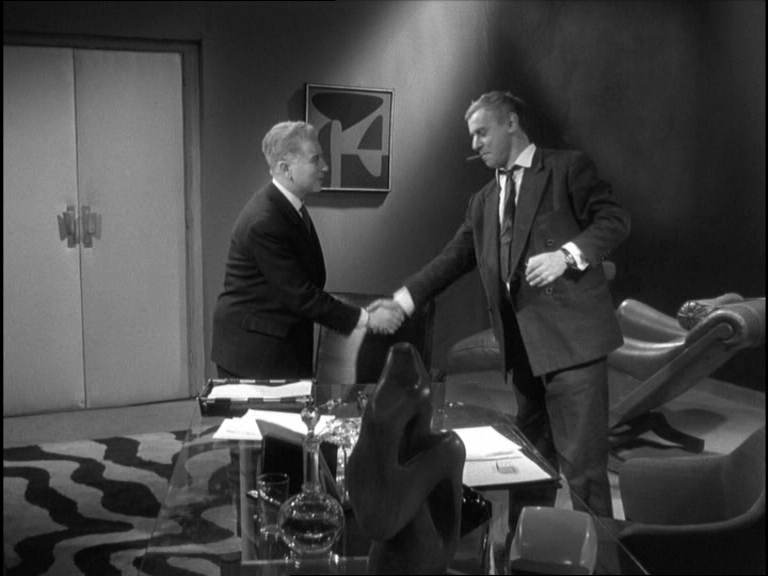 The plot can now develop along lines following Stephenson more closely than usual, though with constant departures into humour or the bizarre. 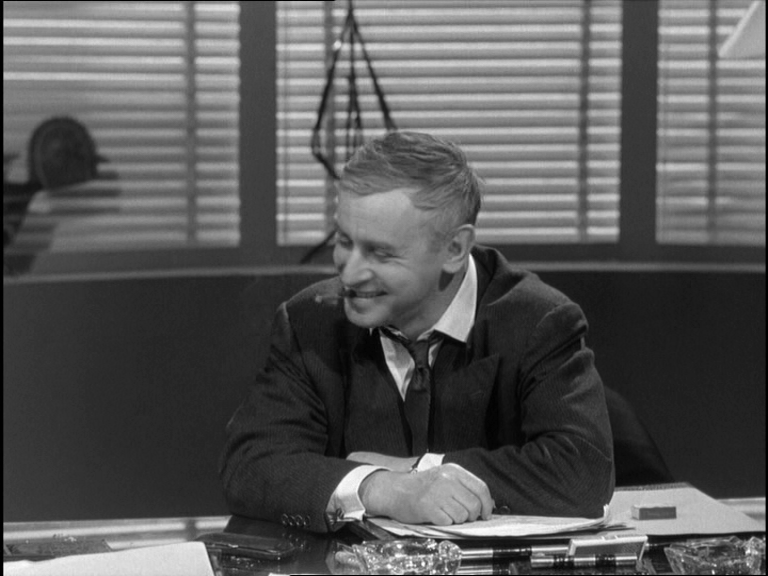 Joly’s departures and arrivals at Vitold’s office must have all been filmed in one session (the film was made very economically and very fast), and Renoir seems to have been in a funny mood that day. Upon first arrival, Joly is scraping his shoe along the ground as if he’s stepped in something, then he trips on the step. 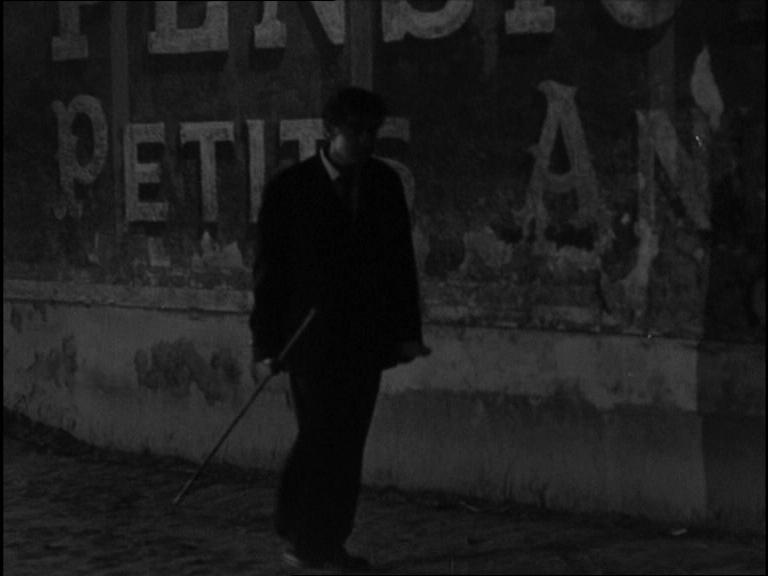 Later, Hyde wanders past and randomly assaults a man on critches, and we are forcibly reminded of the identical scene in L’AGE D’OR — especially since Gaston Modot, the violent hero of that film, turns up later as Cordelier’s gardener. 1) The detectives investigating M. Opale pay a visit to a brothel where we meet M. O’s hapless whore, and see the whip he habitually uses on her. The lead flic also examines two haves of a bra — perhaps symbolising Cordelier’s sundered psyche. 2) Renoir does something quite strange in the second half, stopping the narrative progression entirely to show Cordelier throwing a lavish party for the Canadian ambassador. It’s a very Ferrero Rocher kind of shindig, and asides from showing that Cordelier appears to be feeling better, it achieves absolutely nothing in plot terms. But that very fact adds to the weirdness that is the film’s most pleasurable stock-in-trade. 3) And at the end, Cordelier’s second testament, a tape recording in which he explains his experiments and describes a sinful past unlike anything in Stephenson: as a hypnotherapist, Cordelier has raped unconscious patients. He’s really no better than Hyde, only he feels guilt and the desire to maintain a socially respectable front. Hyde is his excuse to be free of all that. This probably is the most faithful cinematic adaptation, in that it follows Stephenson’s basic shape: a series of clues are laid out and we follow them to the “revelation”. The effect is different though, because while a reader is aware that the story was intended for a public that didn’t know what the story was about, Renoir is pretending that we don’t know where this is heading (although, as you see above, he has a few surprises up his sleeve). I would imagine that the film’s poor reception at the time owes a lot to public and critical bafflement at this bizarre but fascinating strategy. 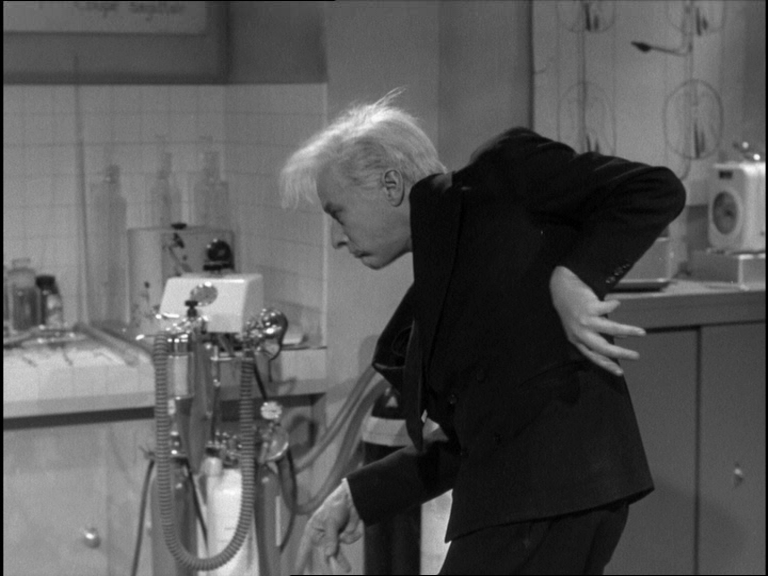 In contrast to almost everybody from Mamoulian to Roy Ward Baker to Jerry Lewis, Renoir makes nothing at all of the transformation, when we finally see it, but allows Barrault to create some impressive spasms and paroxysms as one identity is ripped away and another emerges through it. A religious moral is ascribed to the events by Joly, and Renoir comes back in with a V.O. to wrap things up, leaving us a little uncertain whether what we’ve just seen is meant to be a re-enactment of a fake news story, or what? And it’s not often one finishes a film so unsure of what one just saw.